Carve time out for yourself and invest in the opportunity to learn, play and be inspired. I’m a qualified teacher and my experience covers all ages from 9 – 90. 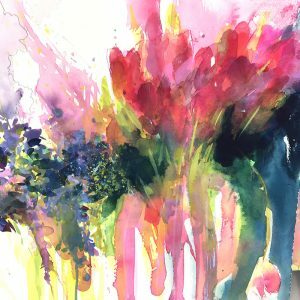 From working in schools, colleges, the community, art societies and for established painting holiday companies such as Arte Umbria and Shades of France I have developed an approach to art, painting and creativity that focuses on you making a connection with your creative spark. This will ignite an ongoing search for wonder in everything that surrounds you. I run creative workshops throughout the year in Arnside, Beetham and at my studio space at The Factory in Kendal which gives you the opportunity to be a part of this exciting creative hub on the banks of the River Kent only minutes from the town centre. Take a peek at thefactorykendal.com. In small groups you will be encouraged to ‘play’ and to develop your techniques and approach using a variety of media. I love to share my love of colour, of life, of paint, as we celebrate the subject, the surface, the materials, the method, the results. Together we learn to connect, to go with the flow, to react, to leave, to loosen up or to attend to detail. The classes are suitable for all levels wishing to release and develop their own interpretation of the world around them. Recent popular themes have included developing mixed media responses to a floral theme and creating abstract collages using a variety of hand-made and found papers. Basic materials are usually provided but do check each workshop for full details. For bookings for Art Group visits or one-to-one private tuition please contact me directly. It would be impossible not to be hugely positive about Janette's workshops. You are encouraged to follow and experiment with a theme, often floral. Slowly and gently, Janette is able to both challenge and tease out of you a composition which you never thought you had in you. Quite an adventure in the aesthetic experience!